Kids will love practicing their addition and subtraction facts with our latest math worksheet. Start by solving all of the basic addition and subtraction problems. 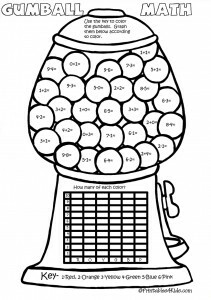 Next use the key at the bottom of the activity to determine what color each gumball should be. Once all the gumballs are colored in, count and graph how many gumballs in each color there are. This is an excellent supplemental math activity for Kindergarten, 1st and 2nd grade math lessons.